Reading and share top 4 Harry H Harrison Jr famous quotes and sayings. 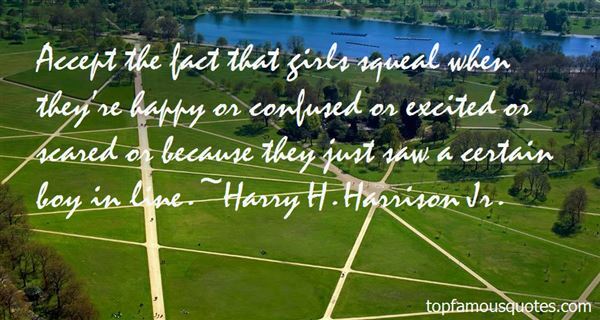 Browse top 4 most favorite famous quotes and sayings by Harry H Harrison Jr.
1. "They should know that just because things get difficult, it's no reason to believe God is on vacation." ~ Harry H. Harrison Jr.
2. "Make sure she can reach you 24hours a day." ~ Harry H. Harrison Jr.
3. 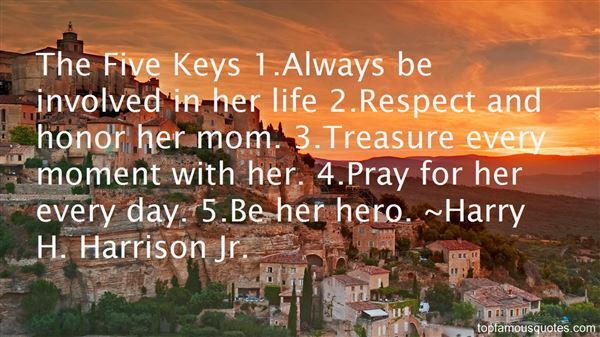 "The Five Keys 1.Always be involved in her life 2.Respect and honor her mom. 3.Treasure every moment with her. 4.Pray for her every day. 5.Be her hero." ~ Harry H. Harrison Jr.
4. "Accept the fact that girls squeal when they're happy or confused or excited or scared or because they just saw a certain boy in line." ~ Harry H. Harrison Jr.
We Latins make splendid lovers and splendid older men."